Ready for some good news? The Grand Canyon uranium ban stands! After a protracted legal battle to defend the temporary ban on new uranium claims around the Grand Canyon from attacks by the mining industry, the highest court in the land has finally put the matter to rest. On Monday, the Supreme Court denied an industry challenge to a lower court’s decision upholding the ban. This puts an end to the legal battle to reopen about 1 million acres of public land around the Grand Canyon to new uranium mining. We’re deeply grateful for the government’s savvy and forceful efforts to defeat the mining industry’s lawsuit, from the trial court to the U.S. Supreme Court. The culmination of years of hard work, this victory is shared — with the Havasupai Tribe who make their home at the bottom of the Grand Canyon, with hunting and angling groups, local governments, allies in Congress, and other partners. And we wouldn’t be here without the hundreds of thousands of concerned citizens like you who have raised their voices to protect the Grand Canyon. Thank you. While this decision is a very big step in the right direction, our work isn’t over yet. The current administration could still decide to lift the ban. It has listed uranium as a “critical mineral” and the Department of Commerce is in the midst of developing a strategy to streamline access to critical mineral deposits, including uranium. The Department of Commerce is also investigating, at the request of two uranium companies, whether to recommend uranium import quotas. Both of these things have significant potential to add political pressure to lift the ban. 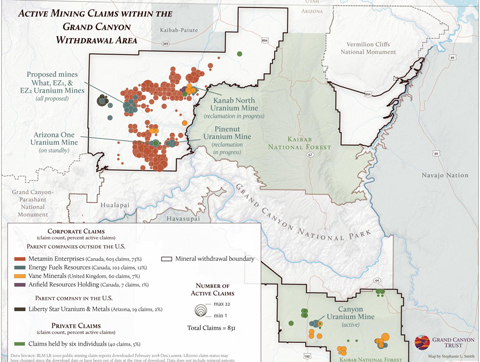 There are more than 800 active mining claims around the Grand Canyon. The mining industry promises to continue to advocate against the ban and some politicians openly call for the ban to be rescinded. A U.S. Forest Service recommendation to review and revise the ban is still floating in the ether. In a meeting last month, Deputy Secretary of the Interior David Bernhardt told the Grand Canyon Trust that the agency currently has “no reason” to reconsider the ban. We’re very happy to hear this, of course, but we remain alert to the ever-shifting circumstances that could move this administration to give in to political pressure and open the door to attempts to weaken or lift the ban. Thank you for your support over the last months and years, and for sticking with us for the long haul, working together to Keep the Canyon Grand. P.S. While this is a critical win, we’re celebrating with vigilance. Pressure from the mining industry continues. Now is the time to double down on protections for the Grand Canyon. Donate to the Trust today. Photo courtesy of Blake McCord. The Grand Canyon Historical Society is pleased to announce the 5th Grand Canyon History Symposium, to be held February 20-24, 2019 at Grand Canyon’s South Rim. We encourage everyone who has done research on, or been a part of, Grand Canyon regional history to consider presenting. Proposals must be received by Friday, May 4, 2018. Since January 2002, there have been four history symposia, bringing together historians, witnesses to history, park employees, and others with a passion for Grand Canyon history. The presentations from each symposium were assembled into a collection of essays. It is the Grand Canyon Historical Society’s intent to publish the proceedings from this symposium as well. The 2019 Symposium Selection Committee will be reviewing presentation proposals with preference in selection given to those that tie into Grand Canyon National Park’s 100 years of history. Presentations concerning the history of the greater Grand Canyon and its adjacent areas within the Colorado Plateau will also be considered. Dates of the 2019 History Symposium presentations will be Thursday Feb. 21st, Friday Feb. 22nd and Saturday Feb 23rd. Since the 2016 Symposium had a limited number of presenters, many who submitted were not selected. Candidates who were not chosen are encouraged to re-submit their proposals for the 2019 Symposium. Those who have presented or submitted proposals for the previous four Symposia are also encouraged to submit a new proposal. Complete details and updates on the Symposium are available at http://www.GrandCanyonHistory.org. Dave Mortenson, President, Grand Canyon Historical Society, at president@grandcanyonhistory.org.